I have kayaked for over 20 years on nearly all navigable waters in Florida. And they are all calm, gentle flatwater experiences. But I am also an adrenaline junkie. So when I moved to the mountain-rich town of Boulder CO nestled in the foothills of the Rocky Mountains this past December, my mouth has been watering countless times when I catch a glimpse of vigorous whitewater creeks and rivers. I vow to myself to ride that exciting, churning water as soon as I can. Then, on a beautiful Saturday morning, fate smiles down at me. Sitting at a yard sale is a cute little Necky whitewater kayak, an item that I had optimistically placed on my “buy” list a few months ago. Along with it comes a mint $150 paddle, a spray skirt, and a life vest. And they are nearly giving it away. I nearly scream to myself in ecstasy. Quickly, I pay for it and pick it up to walk it home. A photo of it is below. The search for a way to get it in the water for a test run is on. Good fortune is soon paying me another visit. My new friend, Ann, knows a guy who is an experienced river guide and whitewater kayak instructor. Would I be interested in meeting him? ARE YOU KIDDING ME, ANN??? OF COURSE!! Appropriately, the instructor proposes we start off getting my “sea legs” by testing out me and my new little boat at the Lyons “playpark,” a place that is known throughout the region for novice whitewater kayak fun. The playpark contains a section of the St Vrain Creek. The St. Vrain is a tributary of the South Platte River, approximately 40 miles long, in north central Colorado. It drains a part of the foothills north of Boulder and the Colorado Piedmont area in the vicinity of Longmont. Middle St. Vrain Creek rises along the continental divide, west of St. Vrain Mountain. 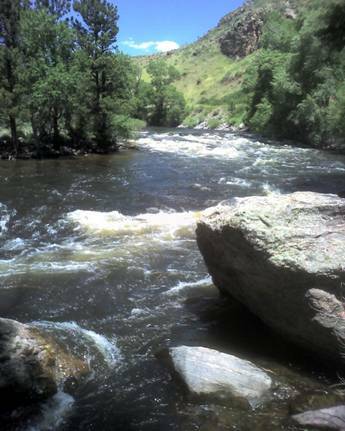 On this sunny Thursday morning, the St Vrain is running at 400 cfs in Lyons. My day of paddling as a newbie whitewater kayaker is a bit humbling, but nevertheless quite enjoyable. Early on, the nimble, eight-foot Necky flips me upside down, but I quickly scramble out of the cockpit with a wet exit. While my comfort level grows in negotiating whitewater drop zones, ferrying across the current, and catching eddies over the course of the day, I find the current to be stronger than I had bargained for. Certainly, 400 cfs coming out of the Rockies is a challenge for a flatlander like me. I ain’t in Kansas anymore, Toto. 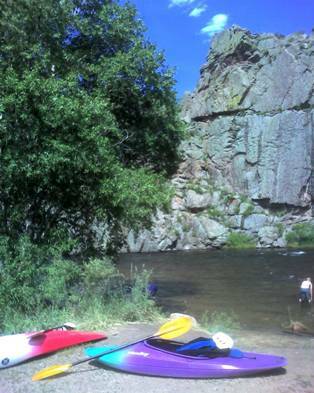 The next day, Friday, finds us heading to the gorgeous Poudre (pronounced poo-der) River. So attractive that the river is the only designated Wild and Scenic River in Colorado. The headwaters of the Poudre are in the Front Range in Larimer County, in the northern part of Rocky Mountain National Park. The river descends eastward in the mountains through the Roosevelt National Forest in Poudre Canyon. It emerges from the foothills north of the city of Fort Collins. It flows eastward across the plains, passing north of the city of Greeley, and flows into the South Platte River approximately five miles east of Greeley. The name of the river means "hiding place of the powder" in French. It refers to an incident in the 1820s when French trappers, caught by a snowstorm, were forced to bury part of their gunpowder along the banks of the river. I am comforted by this scouting guidance from my new friend. Until he shows me the most demanding whitewater on this “Filter Plant” section of the Poudre: Mad Dog Rapids. Here, he suggests a route through the rapids, but it would require my entering the angrily churning whitewater at an angle so that I can strongly, aggressively power my Necky away from dangerous big water on the river right side. River left through the rapids is simply blasting straight through. To safety. He points out that I can either try to run the Rapid, or portage around it if I am uncomfortable. I’m uncomfortable, but am too proud to show it. Besides, I’ve come to this river with my whitewater kayak to immerse myself in the thrills of battling wild-eyed waters coming out of the Rockies. So I commit myself to running it. After all, I’ve previously informed Ann that my will is updated. I wonder, fleetingly, if this will be my last day. Even if I die, I decide it would be an honorable death doing what I love doing. Starting off at Gateway Park, we enjoy several minutes of relatively calm waters. Disconcertingly, though, the current feels even stronger than it did yesterday on the St Vrain, and I don’t feel as if I have much control in guiding the direction of the kayak. Instead, the strong (“pushy,” as my friend calls it) current is mostly deciding where the kayak will go rather than a decision from me. I am a cork wildly and fiercely being jerked up and down like popping popcorn. And the little Necky, with its sharp, unforgiving edges, constantly feels as if it is going to flip upside down. I work hard, though, to keep that from happening in this river, which today is running at a powerful 1500 cfs. Indeed, in the relatively calm sections of the Poudre, I twice flip the boat and must drain the heavy water out of the cockpit. I keep repeating the instructions from my friend in my head. Then, suddenly, my buddy announces The Approach. Next section to negotiate: Mad Dog Rapid. I do what I can to calm myself and recall his many instructions about safely running through the roaring maw of tumultuous whitewater. “Stay river left, Dom!”, I tell myself, fully aware of the uncomfortable fact that I well know this rampaging current controls where my boat goes much more than I control it. Furiously, I dig my paddle hard and fast. I lean forward – fighting the instinct to lean away from the coming jaws of whitewater death. After what seems like infinity, I reach relatively calm water. Somehow, the boat and I are still upright. As folk singer Grant Livingston learned from his grandfather, I kept the “pointy side up.” I am immensely relieved. And proud of my unlikely accomplishment. Dipping the boat upstream is the natural instinct in the same way that inappropriately leaning back on a ski slope is a dangerous yet natural instinct. Leaning upstream into the current significantly increases the tendency of the river current to build up on the boat deck and force the boat to flip upside down. I feel like a deer in the headlights. Hyperventilating the entire one hour route. The stress and strenuous, physically demanding efforts to keep from flipping drain me of energy. But at the same time, it is an exhilarating experience. I vow to one day reach the goal of being able to confidently whitewater kayak without constantly having to think about what to do next. To avoid catastrophe unthinkingly. To lean instinctively in the correct direction. Yes, the Poudre River boasts spectacular scenery worthy of its Wild and Scenic designation. The canyon walls impressively tower over the kayaker. But on this day, I’m too distracted to enjoy it as fully as I would like. All in all, my verdict as an experienced flatwater kayaker and one who has rafted big whitewater in the Eastern US is that here in the Rockies, kayaking Class III whitewater feels like rafting in Class V whitewater. And my little Necky is not, as my garage sale seller told me, a “beginner” boat. It is a quickly responding “playboat” that likes to flip and spin whenever it can. When can I ride again? Two weeks later we are back on the Poudre with my Florida adventure buddy. During one of the rapids we must negotiate, my kayak flips upside down. With my head pointing down, my forehead gets whacked by a boulder at the river bottom. I emerge to find lots of blood coming from my surprisingly unpainful wound. When we started our paddle earlier in the day, I had accidentally put my helmet on backwards. Our instructor points this out to me, and I turn it around to avoid looking like a dork. Ironically, had I NOT turned my helmet around, there is some chance my forehead would have been spared, as the back of the helmet extends lower than the front.